Nart Bouran appointed Director of News for Sky News Arabia. 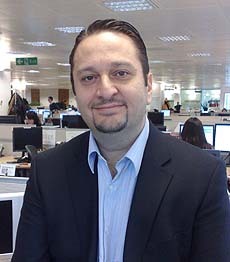 London, UK, 15th February 2011: Nart Bouran - currently Director of Television for Reuters News Agency – has been appointed Director of News for Sky News Arabia. The 24-hour Arabic rolling news channel is set to launch in Spring 2012. Nart has extensive experience in the Middle East having formerly been Director General of Jordan Radio and Television Corporation as well as Director of News for Abu Dhabi TV. The channel will operate from new studios in Abu Dhabi’s twofour54 media zone. In addition, it will have a network of newsgathering bureaux across MENA, further offices in London and Washington DC, and access to Sky News’ wider network of international bureaux. Content for Sky News Arabia will be produced by more than 180 multimedia journalists supported by a full technical and operations team.